Derbyshire’s changing room doors have been busy over the winter, but with more outgoings than incomings. The squad has been trimmed more severely than a US Marine’s hair. Seven squad players have been shown said door, having failed to make a regular place in the first team their own, while only Ravi Rampaul, the ex-West Indies paceman, has come in. This was in response to another disappointing season in the Specsavers County Championship, winning only three games and finishing ahead of only Leicestershire and Durham, who without their points deductions would have been far higher in the table. The club strive for success in the longer format of the game and feel that the bowling attack they now possess can take twenty wickets in a match, something which they have struggled to do for the last two seasons. Derbyshire fared better however in the shortest format of the game, reaching the quarter finals of the T20 Blast for only the second time in their history and will be buoyed by the return of John Wright and Dominic Cork, the coaching team that got them there. This will bring optimism to the side and they will hope to go one better this season and reach finals day for the first time. While there is a positive feeling around the club in the run up to the season, with the signings of Rampaul and overseas quick bowler Duanne Olivier, it would not be Derbyshire if they didn’t have a hiccup to contend with. This season it is their second overseas player. 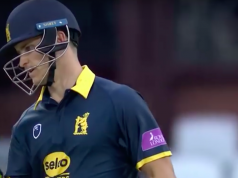 Following the ODI series between England and New Zealand, Derbyshire supporters were salivating at the thought of Mitchell Santner lining up for them in the second half of the season. However, a knee injury has made those mouths drier than the Sahara desert and the club are now scouring the globe for a quality spin bowling replacement. For a club which has struggled to win matches it is key for them to take 20 wickets. Hardus Viljoen, who arrived last year, is a man who can do that for the club. In fact he nearly managed it all on his own in one game last year, taking 15 of the 20 Sussex wickets available. Derbyshire will be hoping that this season he will stay fully fit and be the spearhead for an attack that can propel them up the table in the County Championship and take the 20 wickets required throughout the season. Matthew Critchley has spent this winter getting rave reviews and spending as much time out of Derby as possible, by learning his trade in Australia with Stuart MacGill. He was then selected for the England Lions ODI tour of the West Indies and finally secured a place in the North Squad for the North vs South series, not a bad winter if you can get it. His performances have even drawn praise from Andrew Strauss, as his quick-fire batting propelled the North to victory in the second match of the series. Throw in his ever developing leg spin bowling and safe pair of hands, he really is one to watch for Derbyshire. Expect to see him batting in the middle order at 5 or 6, bowling his leg spin, especially in the limited overs games and fielding in the ring taking blinding catches. The ongoing quest for wickets and propensity for green wickets in early season Derby has lead the club to make South African Duanne Olivier their overseas signing for the first half of the season. Olivier is a slippery but not expressly quick right arm fast medium bowler who gets the ball to talk and move for him and could prove to be a formidable opponent in early season conditions in Derby. They are searching for an overseas signing for the second half of the season with Santner’s knee injury ruling him out for six months. It would be lovely to write here with confidence that Derbyshire will challenge at the top of the table this season and they well could, with a bowling attack of Viljoen, Rampaul, Will Davis, Olivier and Palladino they have the wickets and with Wayne Madsen, Billy Godleman, Luis Reece, Critchley and Alex Hughes they have runs too. However those who have followed the club for a while will know that they could also be more worried about a wooden spoon. Either way, it’s set to be an interesting season and should be good fun, especially in T20 where they will hope to recreate last season’s success. 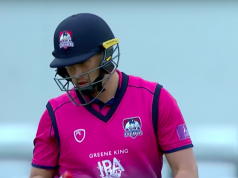 Previous articleWhat could Morne Morkel bring to county cricket?